Please email for a personal invoice if you have difficulty making a purchase via paypal. Visit the contact link above for contact information. There is no email link in order to prevent spam, so you'll have to type out the email link. Join the Official Facebook Group! Get up to date news and events! Welcome to the new Tora Board Game website. THANK YOU BACKERS for SUCCESSFULLY Funding our Prototype Fundraiser! 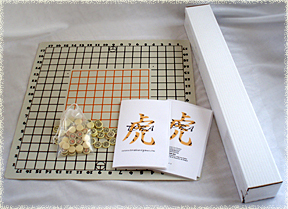 Tora is a classical style board game of a genre often referred to as abstract strategy. The tiger theme of Tora is for the purpose of reminding everyone of the need to protect and rescue ecological concerns world wide in a fun way. The site navigation at the top can lead you to more information about the game, information about registered official companies currently providing access to the game, direct sales to customers, events and licensing. To the immediate left you can click on any of the flags to download a version of the complete rules in the language most prevalent in that country. Konekomimi's Fields is the title of the painting at the top of this page; and was painted by the accomplished artist Timothy Vann Dennis based off images created by Kevin Conner - you may reach the accomplished Mr Dennis through facebook: Click Here.